Tamper Stop tamper evident security tape from RighterTrack is a customizable tamper indicating tape that reveals a hidden graphic and tamper evident "OPENED" message when it is peeled away. This security tape is also commonly referred to as void tape, evidence tape, tamper resistant tape, tamper proof tape, holographic tape, security tape, TSA tape, and pilfer proof tape. Tamper Stop's ultra-aggressive adhesive bonds quickly to a wide variety of substrates including corrugated boxes, plastic pails, polyethylene bags, metals, stretch film, and wood. 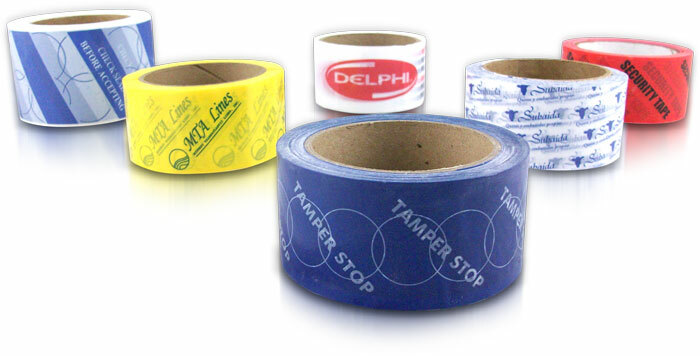 Tamper Stop security tape has been audited and approved by TSA for some of our clients. Security tape rolls can be supplied in your specified width and length; standard size rolls are 2" wide and 60 yards in length. The standard message is "OPENED". Minimum purchase is 50 rolls. We can customize colors, security features, sizes, and printing. Please note that we only offer custom tape, exclusive to you, as opposed to catalog houses who offer generic, easily sourced security tape in small quantities. In other words we are here to protect our clients and their distribution channels. As well as any other pertinent information you deem necessary. Q: Will this tape work on cardboard boxes? A: Yes--our tape performs exceptionally well on a wide variety of substrates including cardboard. Testing on your substrate is always recommended. Q: Why is this tape more expensive than standard carton sealing tapes? A: Tamper Stop is manufactured with a polyester film. The adhesive and its release agent are proprietary. The manufacturing process involves three different pieces of equipment. Also, quite a bit of R&D have gone into making this tape the best product possible. This product is not a commodity. Q: I need to have my company logo printed. What is the minimum size order? What color options do I have? A: Custom printed orders require a minimum of 100 rolls. You can select most colors as a background and leave behind adhesive message, and any color for your custom imprinting. Colors that contrast with the substrate surface are recommended. Q: Can I have my own message revealed? What is the minimum order? A: Yes--the minimum order is 100 rolls. Q: Do you offer any stock products? What is the minimum order? A: We usually stock 2" x 60Yd rolls. Minimum order is 10 Rolls. Q: I only need a roll or two of security tape. Can I purchase from you? A: We have a 10 roll minimum order. Catalogue houses will sell a single roll, which may not be the best idea for security purposes. Q: Why don't you list pricing on this website? Why can't I place on order on-line? A: We offer this high-end security tape as a custom solution, as opposed to catalogue houses. We have personal correspondence with our customers, which results in a more secure monitoring of users, better targeted solutions for particular applications, and overall increased customer satisfaction. Q: Do you ship internationally, or have local distributors? A: At this time we are only shipping this tamper evident tape within the US and Canada. We do not have local distributors. Q: I require pre-cut security seals or tamper evident labels. Do you offer these? A: For inquiries relating to security labels or security seals please contact us. Q: Why isn't more detailed information provided on your adhesive? A: This tape contains silicone release agents between the film and the adhesive, which allows the tape to "trip", or "break away" revealing a hidden message. This release agent, coupled with the wide variety of substrate surfaces, makes it almost impossible to provide adhesive performance properties for every application. Each application should be tested prior to placing an order. This high-end tamper indicating security tape will leave behind a residual “OPENED” message when peeled away. The aggressive adhesive coupled with a sensitive release, works well and consistently on corrugated cartons and substrates of all types*. Security can be enhanced by adding a heat indicating ink, and/or "invisible" ink, that can only be seen under a UV lamp. **HM2707 is a pressure-sensitive hot-melt adhesive that exhibits quick initial tack and bonding to a wide variety of substrates. Service temperature range depends on the substrate, but is typically 10°to 180°F. Testing for each application is required. For inquiries relating to security labels or security seals, please contact us. Get assistance, ask questions, or request a quote or sample by contacting us today. Sorry, there was an error sending your email. If the problem persists, please call: 215-493-7191. ©2019 RighterTrack / Advantage Information Products, Inc.